Disney embarked on a cellular phone business in the US as early as June 2006 but pulled the plug at the end of last year, citing delays in the spread of 3G networks as the major reason. In March this year, Disney carried out another attempt, but this time in Japan, where the brand has been super-popular for decades now. Disney Japan teamed up with local telecom conglomerate SoftBank to become the country’s first mobile virtual network operator (MVNO) offering both voice and data services. In Japan, Disney strategically about-faced by pursuing an OEM-like strategy: They leave back-end operations (distribution, price planning, sales, billing, etc.) to their partner and focus on bringing content, design know-how and brand value into the partnership. Japanese customers can sign up for Disney Mobile at over 2,000 SoftBank stores and buy jointly designed handsets featuring various Disney characters. 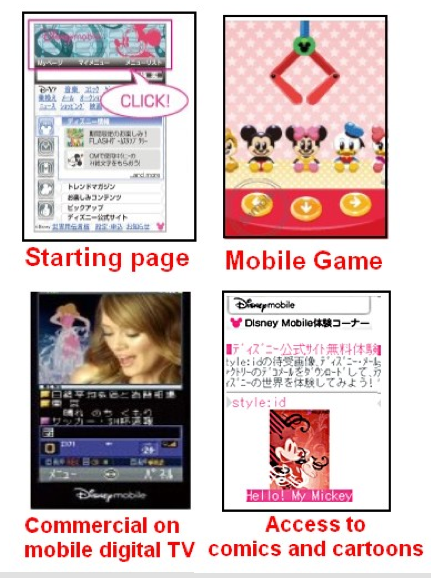 Subscribers are able to download Disney cartoons, games or ringtones, jump to exclusive Disney web sites by pressing a dedicated button on their phones and use @disney.ne.jp as their mobile mail address. Another accommodation to local peculiarities: The main target customers in Japan aren’t kids but women in their 20s and 30s. So far, the change in strategy seems to have worked out well. For example, Disney Mobile just recently reached agreements with mobile giants Mobage-town and Mixi Mobile (the cell phone version of Japan’s biggest social network), which now feature Disney characters on their sites.